For an Early Access title, ValeGuard is polished, the graphics are delightful, and the music charming. Throughout the game you will build a town’s defenses to prepare for a large attack against various enemies. Through your journey you recruit the help of heroes, travelling merchants, and grow your population in order to give the city the best chance possible at surviving the big attack — all while dealing with the potential threat of nightly encounters. One of the first things you'll notice about ValeGuard is the amount of polish and release-worthy content it already has. One of the second things you’ll notice is that while ValeGuard is clearly a RTS game, it has some elements that truly make it stand out against many other RTS titles on the market. What makes any of this truly impressive is that Lost Tower Games is a one-man operation. Based out of Colorado, the studio is run by Ryan Drag, who handles every aspect of the game’s development. ValeGuard’s basic concept isn’t spectacular. You’re a travelling ValeGuard sent to help towns defend themselves against a big attack from an enemy. The way you go about defending the town is much up to you, just like which town you choose to defend (after the first level). There are several ways you can assist the town you are currently defending: You can build walls or guard towers, increase your population (but don’t forget to feed them! ), and recruit the help of travelling merchants, black-market traders, and sometimes even unlock new heroes for later use. 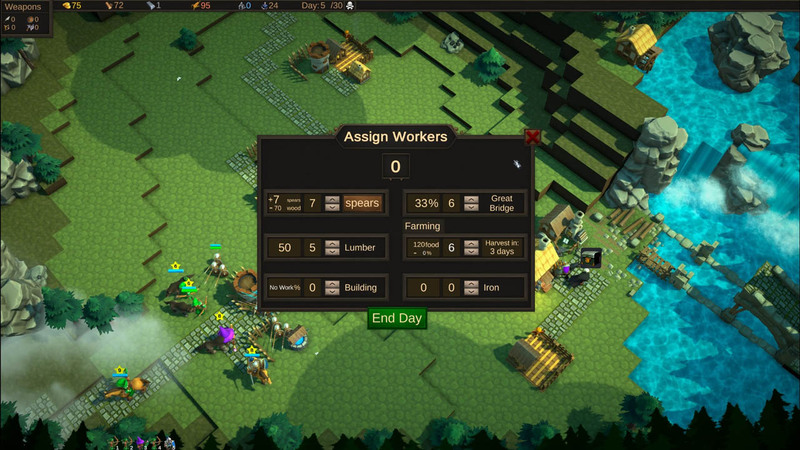 As you build your defenses and grow your town in whatever way you choose, you’ll need the help of one or more heroes. The heroes can cover a variety of different roles, and each have their own perks. ValeGuard didn’t want to just give you the list of heroes to pick and choose from right at the start, because that doesn’t make it interesting. Instead, you have the opportunity of unlocking various heroes throughout the game by completing quests. These quests are not obvious, and depending on what direction you go, or what choice you make, you might miss out on a hero at that time — but don’t worry, the chance isn’t lost forever. If your hero dies you have to start over from the beginning, but once you unlock new heroes, you can choose them right from the first level! You cycle through a few default maps while you level, which luckily doesn’t make the gameplay feel stagnant. Enemies don’t always attack from the same sides, or at the same time. Using the same map allows you to try different strategies as you progress through the game. There are different options based on the heroes you have and the type of enemies you are fighting, so even though the map might be the same, you are engaged in a different scenario every time you go into a new level. The threat of nightly attacks is great and you must make every minute count. Difficulty increases as you progress through the levels, making it a compelling game every minute you play it. As the ValeGuard is currently in Early Access, there are so many things that can be added, tweaked, or taken out completely. The best part is that the studio is welcoming any suggestions. The game has a great amount of potential, and great things should be expected for its release, considering its current state. ValeGuard is worth your time and interest if RTS titles with unique aspects interest you.